Help! 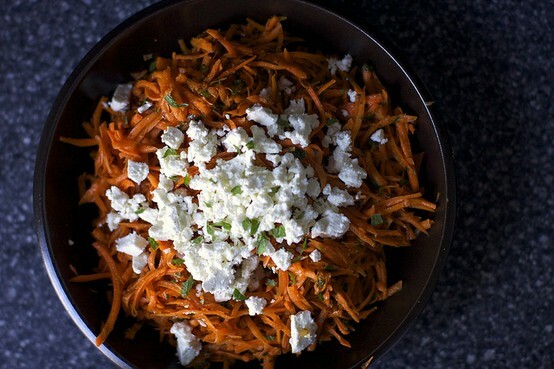 I need a quick, wheat-free vegetarian <br>recipe with Harissa! Harissa is a North African spice mix that's a bit like a distant relative of chili powder, but a bit more exotic. It's got a complex, smoky, garlicky, deep flavor that makes it a great addition to your vegetarian recipes- especially those with roasted (or roasting) vegetables. As Harissa does, notably, have quite a bit more heat than what we consider "traditional" chili powder, use your best judgment when seasoning your recipes. The spice itself can sometimes be hard to find, but you can find substitutes fairly easily--I actually ended up using a "Harissa Rub" from Whole Foods as I couldn't find the spice all by its lonesome, but this seemed to work just fine. Crush the garlic, then put it in a small sauté pan with the cumin, paprika, Harissa, honey, and oil, then cook until very fragrant, about one to two minutes. Remove from heat, then add the lemon juice and salt to taste (I used about 1/8 tsp). Pour this dressing over the carrots and toss to mix. Add the cilantro and mint, then toss again. Let the salad rest for a bit (this gives the flavors a chance to meld), then add the feta right before eating your delicious, vegetarian meal. If you're not trying to go wheat-free or gluten-free, serve this salad up with a nice piece of crusty bread.